One for younger children to have fun making snowmen with all the cut outs. Infinite Wheel - doodle some musical arrangements for fun - amusing no point games with musical sounds. Iain Sutherland former chairman of the Wick Society has for the past 15 years organised the bonfire at Bignold Park, Wick to bring in the New Year. One the council organised this but after it was discontinued Iain took up yet another challenge to keep the tradition going. It was a very successful night last night with up to 100 folk bringing in the New Year and many others arriving to say hello and have a dram by the blazing fire. Happy Christmas From Max and all of us at Caithness.org. Max is in Caithness with Harley from Cumbernauld and no doubt you will be seeing more of the mischievous rascal over the holidays. 130 people attended the Lybster Senior Citizens Christmas Party this year were entertained by various local musicians whilst tucking in to the festive fayre at the Portland Hotel. Amongst donations to the treat this year was Moray Firth Radio Charity Trust. the Christmas Lights At Ormlie in Thurso were switched on by Caitlan Sutherland and Euan MacGregor with Santa looking on for good measure. The Christmas Lights At Dunnet were switched on this year by Lillian Oag. A smaller than usual group turned out for the switch on that has to be set for four o'clock to coincide with the street lights coming on as the decorations are attached to the lampposts. A smaller turnout than usual was caused by the fact that many children were attending Christmas Party in the Viewfirth club in Thurso. The lights committee at Dunnet have for the past few years been erecting and maintaining the lights that now stretch to every lamppost in the village. Santa was on hand for the children. The parade will end at Market Square with a few carols sung by the children round the Christmas Tree along with the Salvation Army Band prior to the switching on of the Christmas lights in Wick. This year Thurso Players are performing the panto "Snow White" in Thurso High School from Wednesday 14 December to Saturday 17 December at 7.30pm with a Saturday matinee at 2.00pm. Tickets are priced at £7 and £5 and go on sale from Tuesday 22 November from McBeaths Jewellers, Thurso. 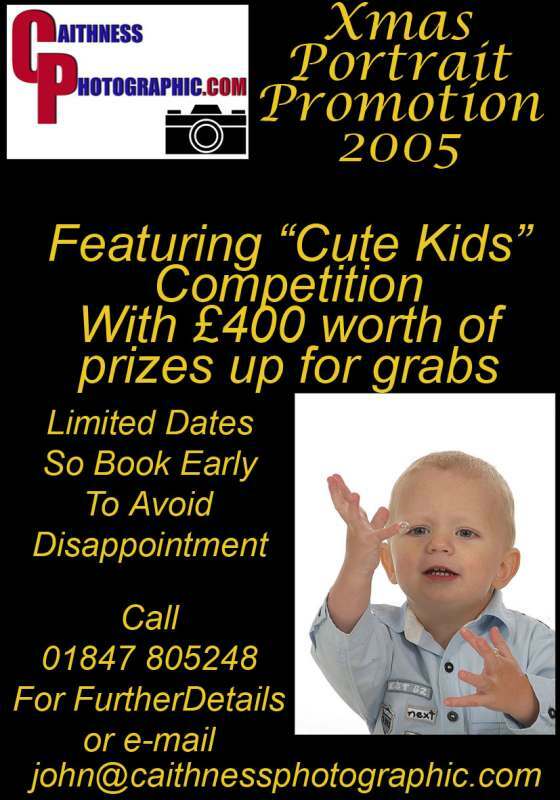 Local award winning photographer John Baikie of Caithness Photographic is running a competition in conjunction with his Portrait days on 11,12,17,18 and 20th of November 2005. If you want special family photo for Christmas contact him early to make an appointment at Castletown. He was very busy last year so don't leave it too late to book. Your portraits will be entered in his competition for the best photos with up to £400 of prizes. The Video/DVD's (in PAL format) of Thurso Players Pantomime are now ready. Anyone wanting a copy can get it directly from me at £12.00 + £1.00 p&p. Telephone number is 01847-896956 and my address is 5 Heathfield Road, Thurso KW14 7DT. A new Christmas Gallery to hold a few photos of Christmas lights around Caithness. If anyone would like to add to the gallery take photo of some Caithness Christmas lights in your area and send them in. Milton Children had their Christmas Party at Staxigoe Hall where the recently installed bouncy castle is proving to be great draw. Santa was on hand to give out the presents although this year the number of children was down due to the bug that has hit many of the county schools. A few of the children could not make the party this year and presents will be delivered to them at home. Anyone thinking about a party should think about Staxigoe Hall as the hire is cheap and you can hire the bouncy castle as well. Electricity is paid on meter and the folk from Milton thought it was very good value for their party. Over the Christmas period it is estimated that we will produce approximately 30% more waste than usual. In the UK,1 billion Christmas cards will be sent, 10 million turkeys will be sold 83 square kilometres of wrapping paper used, seven and a half million trees bought, an extra 750 million bottles, glass containers and 500 million drink cans used. Most of these items are thrown in to people's bins and end up on landfill sites. However, up to 60% of the waste that is thrown away can be recycled or composted. Thurso Players take to the stage of Thurso High School this evening with their production of Snow White. The script, written by Stephen Reade, differs somewhat from the traditional version and is packed with subtle humour. There’s Snow White of course and her aunt and arch nemesis, the wicked Queen. Then there’s the Huntsman, hired by the Queen to dispose of Snow White before she turns 16 and inherits the castle and all the wealth of the Kingdom. There’s love interest in the form of Brad Hill (Glyn Jackson) and a not so charming Prince Colin Pratt of Burnside (Iain MacDonald). A couple of strangely familiar brothers from Manchester, Noel and Liam, make an appearance from time to time intent on ‘splatting’ a demented Midge who continually invades the stage. Then there’s the seven, or is it eight, dwarves and ………………….. well, for the rest you’ll just have to come along and see for yourselves. Snow White runs nightly at 7.30pm from Wednesday 14th to Saturday 17th December with a Matinee performance at 2.00pm on Saturday afternoon. Tickets are still available from McBeath’s Jewellers, Traill Street, Thurso but don’t leave it until the last minute as they are going fast. Snow White, not yer’ average Panto! Local artist Richard Arrowsmith now has over 70 original oil, acrylic and digital paintings in his online gallery ranging from Thurso and Wick landscapes, to wildlife and portraits. Looking for a unique gift to give your loved one for Christmas? Then visit www.CaithnessArt.com today! All prints now only £15 each with FREE P&P within the UK. The Highland Council has announced details of the programme for this year's City of Inverness Christmas Lights Switch On Ceremony which will take place on Thursday 24th November at6.30pm. Three new CD's of accordion, fiddle and pipe music recorded over the last 25 years. Produced by Ross Records and available in the Music shops in Wick or Thurso or from Ross Records. £7.99 each or £20 for all three.